2.35 million households in England living in poor quality, energy inefficient housing have to decide each winter whether to ‘eat or heat’. They live in cold homes because they can’t afford to pay their fuel bills and then suffer from respiratory illnesses which have long-term effects on their health and wellbeing, and sometimes fatal consequences. Last year, England and Wales experienced the highest number of ‘excess winter deaths‘ in fifteen years, with 43,900 dying – 27% more than during the non-winter months. It’s an urgent issue that needs solutions. 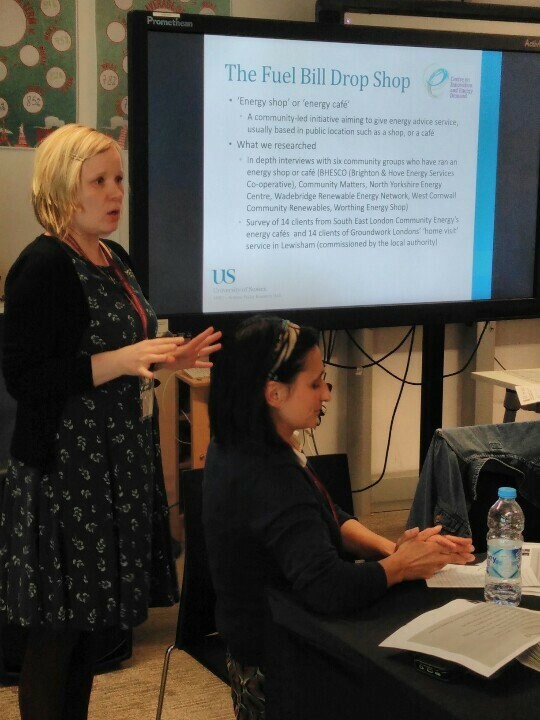 A workshop on Community Solutions to Fuel Poverty was held on 13th May in Hastings – an area badly affected by fuel poverty – and was attended by a mix of stakeholders, including local government, community groups, academics, energy utilities, as well as the local MP, RT Hon Amber Rudd, Secretary of State for Energy and Climate Change. The aim of the workshop was to bring together a range of expertise in fuel poverty work and present concrete policy recommendations to the Secretary of State. Dr Brenda Boardman spoke about the challenges of identifying those who live in fuel poverty at the workshop, which was organised by non-profit organisation Energise Sussex Coast. Boardman, who envisaged the concept of fuel poverty 25 years ago while doing her PhD at SPRU, said many fuel poor are ‘hidden’. They might not want to seek help due to the stigma attached to being fuel poor or don’t know how to seek help, or they are ‘chaotic’ people who face a myriad of problems, of which fuel poverty is only one. The Secretary of State said that “addressing climate change addresses fuel poverty”. Rudd said the government was working with The National Institute for Health and Care Excellence (NICE) to provide guidelines on how to deal with fuel poverty and highlighted the importance of working with local GPs and local councils, especially in focusing government funding on the most cost-effective way to help those living in fuel poverty. I later asked the Secretary of State what the government was doing in order to better identify those who might be vulnerable to fuel poverty and Rudd responded that the Department of Energy and Climate Change (DECC) was working with the Department of Work and Pensions (DWP) to see if data sharing between the two departments was possible, although she provided no further details on whether and how that might be done. However, as Boardman previously highlighted, with 20% of those people living in fuel poverty not claiming any benefits, identifying the fuel poor via data on those receiving benefits would mean that some people wouldn’t be identified and reached. One of the issues discussed widely in the workshop was the private rented sector and how, despite landlords’ obligation to pay for energy efficiency measures, many tenants end up living in very poor housing conditions. A key policy recommendation made to the Secretary of State was the need to invest in better quality, energy efficient housing across all housing tenures, including owner-occupied as well as the private and social rented sectors. An area-based, street-by-street approach was suggested to address the energy efficiency of housing. 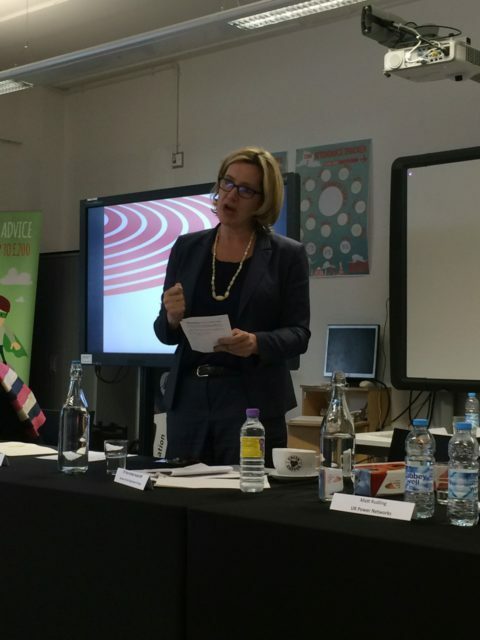 Rudd said that the government was continuing to work with landlords on addressing the issue. The Secretary of State also stressed that any energy efficiency works undertaken in people’s homes should be to a good standard. She also said that the government’s review by Dr Peter Bonfield on consumer advice, protection, standards and enforcement for energy efficiency and renewable energy was due to report soon, with details on how these standards would potentially be enforced. At present funding, albeit limited, is channeled to fuel poverty work via energy utilities in the form of the Energy Company Obligation. However attendees at the workshop thought that local authorities would be better placed to deal with fuel poverty. This would also help to frame fuel poverty not just as an energy, or carbon issue, but also a social and health issue. Enabling local authorities to work closer together with community groups and health authorities would provide a better targeted service to those faced with fuel poverty. This would, however, require on-going funding and data sharing between different authorities, which is a contested and difficult area to address. Our research in this area could help. We found that community-led ‘energy shops’ could act as a triage service bringing together local authorities, community groups and the health service to assess the needs of each client and then refer them to other forms of intervention depending on needs. It remains to be seen whether and how the final and formal policy recommendations from the workshop will be listened to. At the workshop the Secretary of State struggled to remember how many people the government had lifted out of fuel poverty. While this might have been a temporary oversight, the fact that energy efficiency does not feature prominently in Lord Adonis’ National Infrastructure Commission is not. Much remains to be done. As Dr Mary Gillie from Energy Local pointed out, we are one of the wealthiest nations in the world and yet fuel poverty, which kills people every year, is allowed to persist. Smart meter rollout in the UK: towards a low carbon future?